November 12 event lets you collect coins, receive a cool exclusive and purchase Super Mario 3D Land a day early. There are video game events, and then there's Nintendo's awesome sounding plan to throw the biggest, craziest most over the top Mario party the world's ever seen. On Saturday, November 12 at 10:00AM, Nintendo will literally take over New York City's Times Square, or more specifically, Military Island, located at Broadway and 7th Avenue between 43rd and 44th Streets. You know you want your very own Tanooki accessories. Show up (Why wouldn't you? ), and you'll take part in pure Mario bliss that includes a life sized replica of Mario's 3D world, complete with gold coins and the familiar flagpole. Even better, you'll be able to complete this insane sounding obstacle course. -A performance from a mass group of Nintendo characters at the start of the event. -A set of exclusive Tanooki ears and tails as featured in the original franchise, rewarded to fans onsite throughout the event (available while supplies last). -A "Mushroom Kingdom" Pizza truck nearby offering free mushroom pizza slices to the first 1,000 consumers onsite that tweet using the #SuperMario3D hashtag. -Additionally, in advance of its official Nov. 13 release date, Nintendo is rewarding its biggest fans in attendance with an exclusive limited early sale of the game at Toys "R" Us located in Times Square on Nov. 12. -A multi-sensory environment constructed from the ground-up to depict Mario's World in the middle of Times Square. -Inside Mario's world fans will be jumping for coins, going into a warp pipe and sliding down the iconic flagpole. 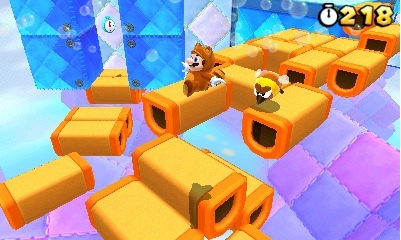 -Super Mario 3D Land game footage featured on the Jumbotron that fans and passersby can watch. OK, first, we want the Tanooki ears and tail. That goes without saying. Second, we need to dive into that "multi-sensory environment". Yes, it will be super cold and possibly raining, but come on...how could we pass this up?